A historian has been arrested in central Russia after police found the corpses of 29 women, dressed as dolls, in his apartment, authorities said this week. Some were cloth masks while others were in the process of being rebuilt to look less decayed. The 45-year-old man, who police did not identify, has been charged with desecrating bodies and graves, officials said. Video released by police showed an eerie collection of what looks like life-sized dolls, outfitted in shabby dresses and headscarves, their hands and faces wrapped in fabric. Authorities say the man also stole clothes from the graves when he took the bodies. Russian Interior Ministry spokesman Gen. Valery Gribakin told CNN police couldn’t figure out for a long time who was behind the “numerous blasphemous acts against the graves and the dead bodies” at several cemeteries in and around Nizhny Novgorod, about 250 miles east of Moscow. The incidents started about two years ago, authorities said, with each case producing a public uproar in the region. Gribakin said police went the extra mile to find the culprit. But even seasoned investigators and forensic experts were shocked when their investigation led them to the historian and the contents of his apartment, where the women’s mummified bodies were found. The corpses were those of women who died between the ages of 15 to 25, officials said. The suspect faces charges of desecrating dead bodies and their burial sites, a crime punishable by up to three months in jail or a year of correctional labor. 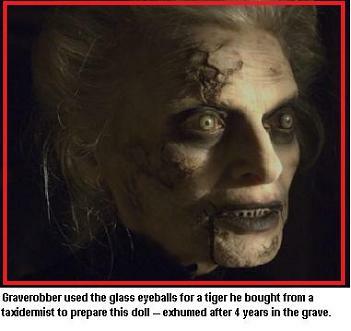 Snooki a Graverobber? Justin Bieber Paternity Test Results?